J.R. Phillips started the 1995 season looked at as the Giants' possible long-term first baseman. After getting the shot, though, it didn't work out. He hardly hit. Phillips told The Philadelphia Inquirer later he knew why. "I tried to go out and compete with Matt Williams and Barry Bonds right off the bat," Phillips told The Inquirer, "instead of just going out and doing what I do." Though his bat never really did catch up with him, Phillips went on to do what he did in seven major league seasons, in 242 major league games. His best season was that 1995 campaign where he hit just .195, but saw time in 92 games and hit a career-high nine home runs. Phillips' career began in 1988, taken by the Angels in the fourth round of the draft out of Bishop Amat High School in California. Phillips actually came out of high school as both an accomplished hitter and an accomplished pitcher, according to The Los Angeles Times. "He's just a super athlete," Phillips' high school coach Glenn Martinez told The Times. "He's the kind of kid who does it all. I coached him in football, too, and I know what he can do." With the Angels, Phillips settled in playing the field. He played his first season between outfield and first base before finding a home at first. He played 1988 at short-season Bend. 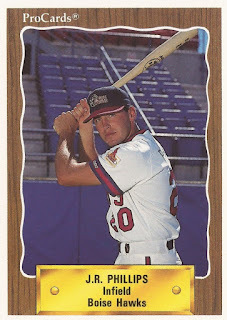 He made AA Midland in 1992 and then AAA Phoenix in 1993. He also debuted with the Giants in 1993, getting into 11 games that September and going 5 for 16. He got into 15 more games in 1994, hitting .132. Phillips then started 1995 as the Giants' regular at first base. Through his first 32 appearances, he hit just .101. He had some success in July, hitting a 14th-inning walk-off home run. "Everything is a lift," Phillips told The Associated Press, "especially with the way I've been hitting." Phillips played early 1996 back with the Giants. He was then traded to the Phillies. He got into 50 games total that year. He moved to the Astros for 1997 and 1998, getting into 49 games total. He played his final major league games in 1999 with 25 played with the Rockies. Phillips then continued playing in the minors and overseas. He played in Korea in 2001, then moved to Mexico. His final recorded games came in 2005 at AA and AAA with the Astros.